Sigh….. the plan to spend this incredibly windy, rainy, but warm afternoon knitting away was in vain. 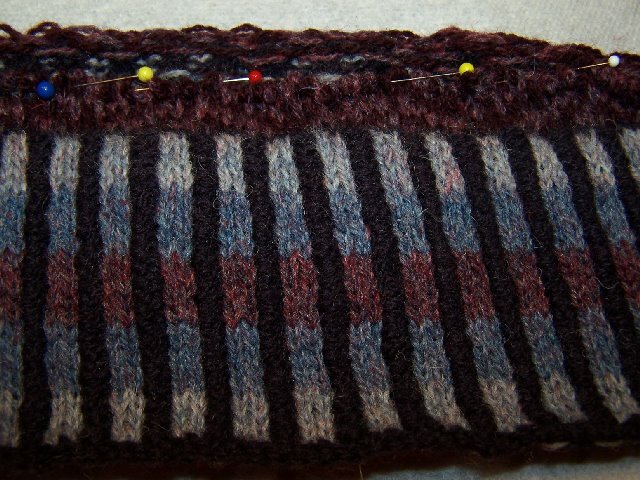 I finished the corrugated ribbing on the Whirligig Vest and started off on the body. Note to self – do NOT try to set your pattern on the first row while watching HGTV. My memory is just not that good anymore. Out came the first row since I kept insisting on not starting each pattern repeat at the right place. 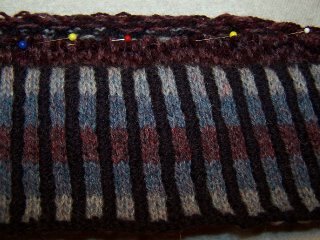 Finish knitting up 7 rows on 321 stitches plus steek and decide that there is not enough contrast (and yes I did swatch and thought it was okay). Have husband look and he says “how many colors are there supposed to be there?” RIP what is shown in the photo except for the ribbing. I had found only 5 balls of Jamieson Mulberry (#598) and was trying to use Mulberry in the ribbing and the 5 balls of Port Wine (#293) in the body. I thought it would be okay to have two dark colors and was trying to use what I had. Wrong. Will now continue with the Mulberry in the body and go on a search for 1-2 more balls from any LYS and/or on line vendors. I’m a bit frustrated but at least now I hopefully will remember where the pattern starts for the size I’m making. I always photocopy the graph and use a magnetic marker strip/board to keep track of the pattern. Guess I’m going to have to color code the starting line <G>. At least we still have power after this wild wind storm; many in the state of Maine do not tonight. Then again, I’ve knitted and quilted by Coleman lantern light before. Hi, and thank your for visiting my blog. The mittens. I have bought the book with the pattern, and it is Norwegian. I dont know if it is aviable in your language. You could go to this site, and maybe ask them if they can help? If not, please mail me!